Cervical spine pain is a common diagnosis and for many it can last more than three months (then you are labeled as a chronic pain patient). Physical therapy is a definitely something to consider if you are looking for chronic neck pain relief. Neck pain is one of the most common health problems throughout the world, and it’s second only to back pain when it comes to painful disorders affecting the muscles or bones. Statistics vary on just how prevalent neck pain is, but some figures estimate that up to 80% of Americans experience at least one episode of neck pain each year. Dealing with neck pain can prove to be a major obstacle in living and functioning normally, and can even lead to some individuals being unable to work. The majority of people who get neck pain improve on their own within a few days or possibly longer, but for some, it spirals into a long-term and bothersome problem. Between 50-85% of patients who develop neck pain will not experience a complete improvement in their symptoms, and almost half of these individuals will go on to have chronic neck pain. 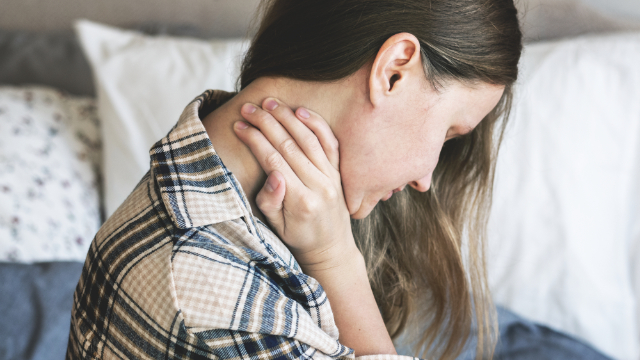 The term chronic neck pain is used to describe pain that lasts for more than three months, and it can lead to additional issues like stress, anxiety, reduced quality of life and a tendency to avoid certain behaviors that might aggravate the pain. This shows why it’s important to develop strategies for treating patients with neck pain early in order to help them avoid any long-term complications from their problem. There are many treatments available to address neck pain, but one of the most reliable approaches is physical therapy. The primary benefit of physical therapy is that it takes into account each patient’s symptoms, goals and abilities, and each treatment program is tailored around these individual factors to produce the best possible outcomes. Programs vary from patient to patient, but usually include a variety of treatments, such as deep tissue mobilization, patient education, exercise therapy, stretches and/or manual therapy, which consists of mobilizations and manipulations applied to the neck region by the hands of a physical therapist. The results suggest that a combination of cervical mobilization with routine physical therapy is more effective for reducing pain and disability and improving neck muscle endurance and neck range of motion in patients with chronic mechanical neck pain compared to routine physical therapy alone. Just because neck pain is common doesn’t mean it’s something that should hold you back in your daily endeavors. Address your neck pain early by seeing a physical therapist if you notice lingering symptoms, and you’ll be reducing your chances of experiencing bothersome long-term problems associated with chronic neck pain.